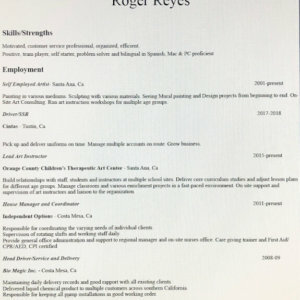 Resume posted by EyesR in Arts and Culture. Studied Fine Art at Santa Ana Collage, Graphic Arts at Platt College and Animation at Art Institute of Santa Ana, CA. I have been creating and showing art in Santa Ana for many years. Taken commishioned work for many private collectors as well. Currently, I have numerous murals throughout Santa Ana and have worked on many others in collaborations with artist and groups. I have booked graphic art jobs including logo design for local business’. I’ve held art instructor positions and lead work shops for different organizations the last few years.